Cottage pie, but not as you know it. 29 October 2015. I’ll be brief today – we had a stay at home and clean the bedrooms day today, the girls and I – it is so satisfying to dump clothes that are far too big for you and to try on stuff that you haven’t been able to wear for a very long time. I am tempted to hold on to the largest of my clothes so that I can do a before and after, but you know I’ve done that before and then fitted right back into those clothes. So this time I’m binning them and will never wear them again. Today I hit a milestone. I got my BMI under 40 for the first time since I started this plan. I have hovered at 21 pounds off for about three weeks and today it finally plummeted again so I now have 23 pounds off. But the bigger achievement for me is the BMI – I started at 43.64 so to finally get under the 40 and score a 39.71 is a huge psychological boost. The fact that I have done that in less than ten weeks is pretty impressive, and with no hunger pangs or desire to “break out” is even better. Cottage pie. Looks like it, tastes like it and is totally delicious. Our middle child even begged for extra cauli mash! Apparently it was “your best one yet Mammy”! 1 cup veg stock – I really need to buy some beef stock! I threw in the mince for about five minutes first, then tossed in the onions, garlic and celery. I let that cook down for about ten minutes then threw in all the rest of the ingredients. I turned down the heat to simmer and let it cook away for about half an hour. Meanwhile I cooked the cauliflower in a little water – you should steam it but there was a very big pot of it there so I just boiled it up. 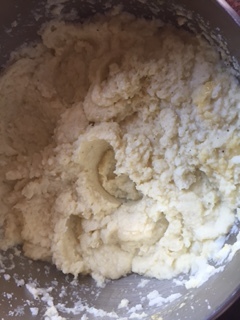 When it was just soft I took it off the heat and used a hand held blender – the stick type – to puree the cauliflower with the butter and cream. 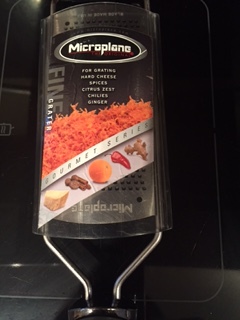 Then I added a good grating of nutmeg – I use the whole nutmeg and I have a fantastic microplane fine grater – it’s about five years old but still as good as new – they aren’t cheap – about €30 each but it’s a great investment. I’ve used this one for nutmeg, lime zest, chocolate, parmesan – the list is endless. 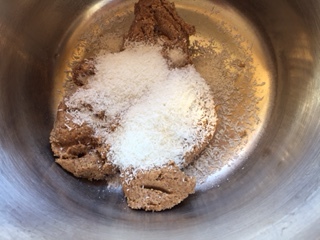 I then added a good quantity of salt and black pepper and left it to one side. Bláthnaid spent the afternoon pinching it from the pot – such a healthy snack to be sneaking instead of sweets! Then I assembled the cottage pie. 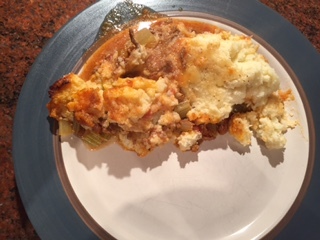 I dumped the mince mix into my standard lasagne dish and just spooned the cauli mash on top. I topped it off with some grated cheddar and then put it in a pre heated oven at 170 celsius for about 40 minutes. It came out looking golden and delicious – as you can see below. 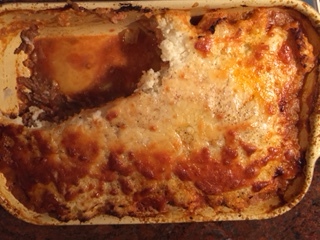 It also cut and looked just like traditional cottage pie. It was very filling and has now also been added to the list of banting dishes we like in this house! It’s interesting that we started this journey ten weeks ago and the media has been inundated since with articles about fat being good for you and sugar being the very devil! Maybe we are just more aware of it all – here’s a link to another very interesting article that was published in Men’s Health just this week. I made these with a view to bringing them to our Halloween party on Saturday. My children said no! 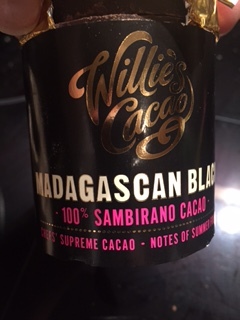 They are yummy – I think – but then that’s because I’ve had no sugar for 70 days – their taste buds are not quite so sensitive yet! They are very quick to make and I will definitely be trying them in different variations over the next few weeks – as I fix them I’ll keep you updated! 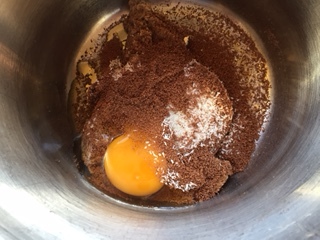 plus one egg. I bought that chocolate in Avoca a couple of weeks ago – it gives a great chocolate hit but you wouldn’t eat it by itself – it’s very bitter. At €7.70 it’s not cheap but a very little goes a long way. Then I used the beater to blend it. 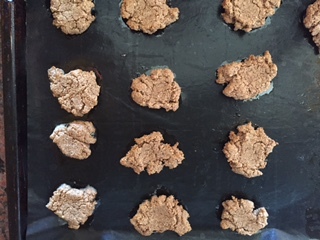 It didn’t exactly blend like a soft dough but it did come together and I put it onto the baking tray in small mounds – I got I think 13 from this amount. They went into a 160 celsius fan oven for about 9 minutes and came out looking pretty much like they did when they went in! I actually really liked them. They have a chewy texture like chocolate chip cookies but there is no sugar hit from them at all – you are kind of waiting for that to hit you and then – it doesn’t! Would I add these particular biscuits to my repertoire of banting recipes? I don;t think I’d be making them every week, put it that way. but it was an interesting experiment. I had two of them yesterday and still lost weight so maybe I should add them to the list after all! Tomorrow I’ll be trying out some cheesy muffins I saw on the real meal website this morning, and making some very unhealthy sweet treats – maybe I’ll see if I can slightly “bantise” my normal recipes! Next PostNext Baking as a banter – it’s not that simple! 31 October 2015.